Govrenorates o Egyp. See key below. Egyp is dividit intae 27 govrenorates (arabic singular muhafaza). This designation replaces that o "province" (muderiya). Egyptian govrenorates are the top tier o the five-tier jurisdiction hierarchy. A govrenorate is admeenistered bi a govrenor (muhafez) appointit bi the preses o Egyp. Maist govrenorates hae a population density o mair than ane-thoosan per km², while the 3 lairgest hae a population density o less than twa per km². Govrenorates are either fully "urban" or else they are an admixture o "urban" an "rural". The offeecial distinction atween "urban" an "rural" is reflectit in the lawer tiers: i.e., fully urban govrenorates hae nae regions (markaz), as the markaz is, natively, a conglomeration o veelages. Mairower, govrenorates mey comprise juist ane ceety, as in the case o Cairo or Alexandria. Hence, these ane-ceety govrenorates are ae dividit inae districts (i.e. urban neighborhuids). Cairo consists o 23 destricts; Alexandria consists o 6. 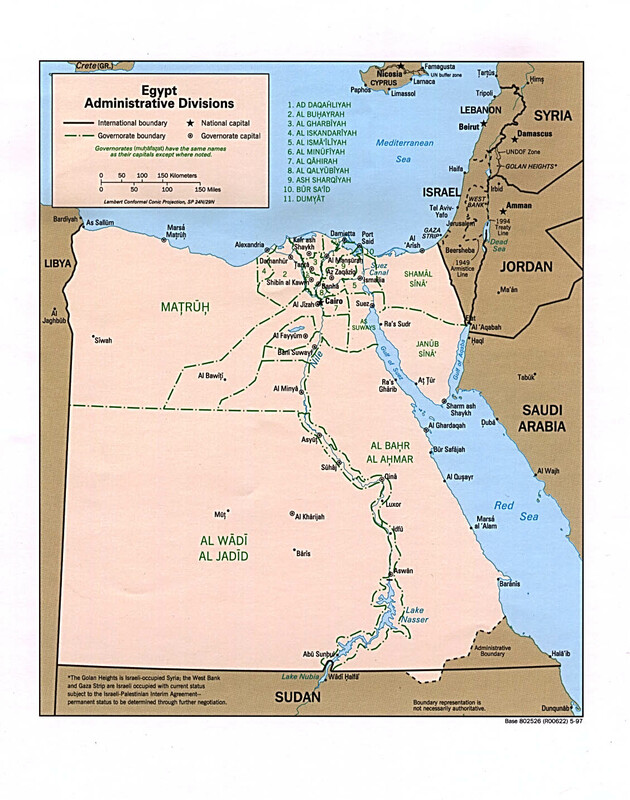 Non-urban govrenorates in Upper Egyp an alang the Suez Canal are aw named efter their caipitals, while govrenorates in the Nile Delta an the deserts tend tae hae names different frae their caipitals (Kafr el-Sheikh, Damietta, an Matruh Govrenorates being exceptions). Twa new govrenorates wur creatit in Aprile 2008, Helwan an 6t o October. In Aprile 2011, baith the 6t o October an Helwan govrenorates wur incorporatit intae Giza an Cairo respectively again. Luxor wis creatit in December 2009, tae be the 29t governorate o Egyp. The govrenorates are further dividit intae regions (markazes). ↑ Reem Leila. "Redrawing the map". Al Ahram Weekly (On-line). Retrieved 2008-05-19. This page wis last eeditit on 13 Apryle 2016, at 21:52.